I hope you had a lovely, relaxing and inspiring Saturday! This morning I went to Clipper Cafe for breakfast and when I returned home I found this oishii bento lunch box surprise that was left as a treat in the fridge for me! A $6.50 Salmon bento from Tokyo Mart! 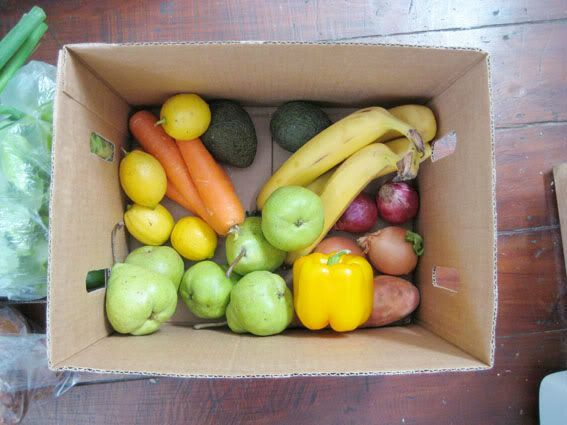 And another yummy boxed treat...my mum and I ordered our fruit and vegetables to be delivered this week! 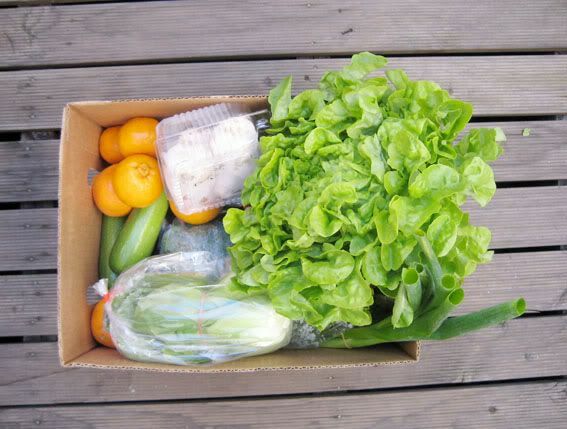 We called upon Fresh Food Direct to deliver super fresh, super convenient and super cheap and cheerful fresh foods! yay! Hope you had a lovely Saturday lovelies! My oishii Ueno bento on the skinkansen. A selection of delightful Ekiben. Just when you thought I couldn't possibly post about Bento boxes again! In case you aren't already having enough fun riding on the Shinkansen, enter Ekibens to add to the fun! Eki (Station) and Ben (short for Bento) are divine little lunch boxes bought from train station vendors. Mini-me portions of delicious Japanese food neatly arranged into pretty packaging all at a minimal cost. There is something so lovely about settling in to your Shinkansen seat, watching the Japanese landscape change as you move rapidly from city to city, sipping on your tsumetai green tea and eating your special bento! Ahh bliss! Hmm and with Jetstar announcing return tickets to Tokyo from Sydney including tax for $525 I am very tempted to book myself in for some more Ekiben fun! 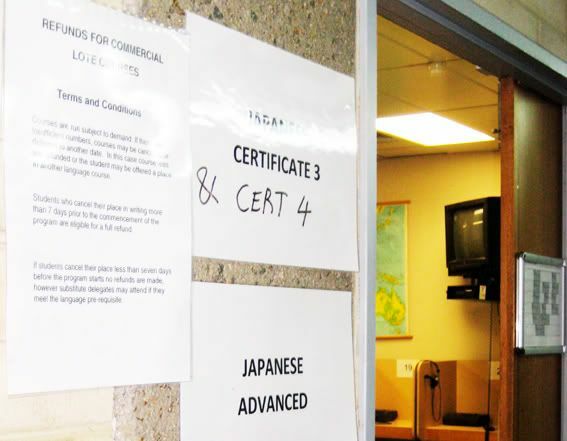 For more info click here (Japanese only), here or here. An Ekiben shop found at all large train stations. Little picks for almost anything - I usually make a western style ham, cheese and tomato stack. ow! my favourite coloured faux grass! If you can't get your hands on bento patties, you can always substitute with cup cake patties. 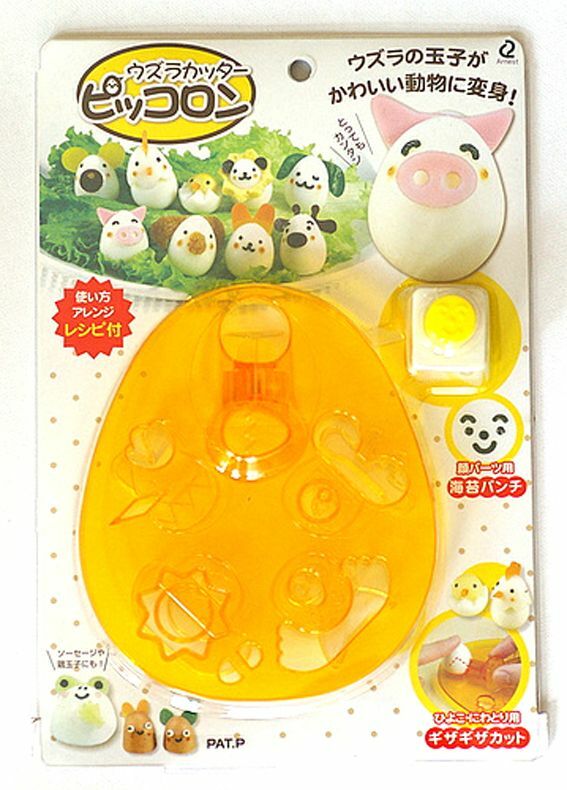 Little egg shapers for your boiled eggs! The trick is to pop you boiled egg in while its very hot so it cools in one of the above shapes. Mini dressing holders. yes please! 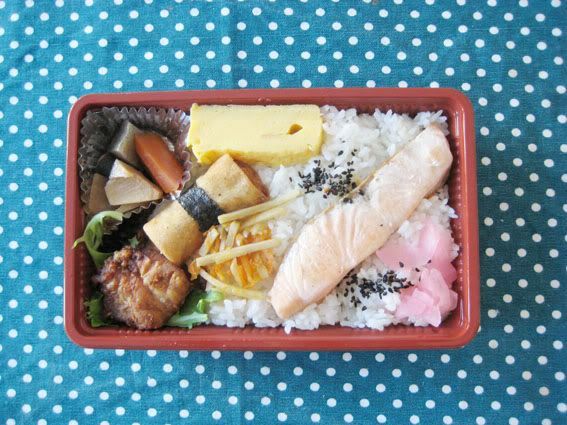 A while ago I mentioned my love for Bento boxes, you can see the post here. But today I wanted to also share my obsession for Bento accessories! After all, what fun would packing a bento be if you didn't get to use cute accessories such as pink faux grass, panda head mini sauce containers, and love heart tipped tooth picks? Alphabet cutters so you can form messages in things like ham or cheese. 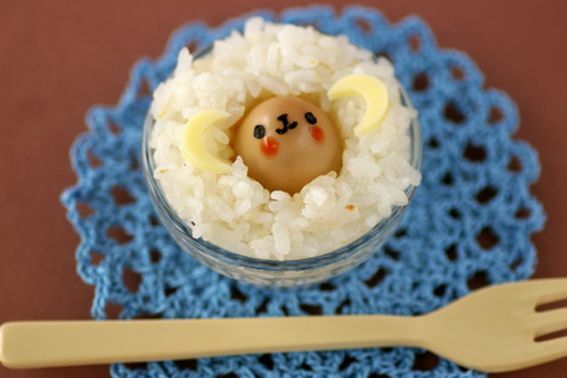 Make some characters in your bento! Today my boyfriend packed me my favourite bento. Miso-mayo steamed salmon (I will post the recipe for this soon), rice with goma shio furikake (black sesame and salt seasoning) and mixed salad bento complete with a sweet little message cut out of seaweed on top. I should tell you, I have a small addiction to Japanese bento. I just love them! They are perhaps, one on my most favourite things in life. I love everything about them, the special feeling you get when you see your pretty furoshiki (bento napkin) tied around your bento peeking out of the fridge, the healthy ingredients in mini-me portions, the layout and composition of the ingredients (oh dear I am still talking like a designer even when talking about food eek! 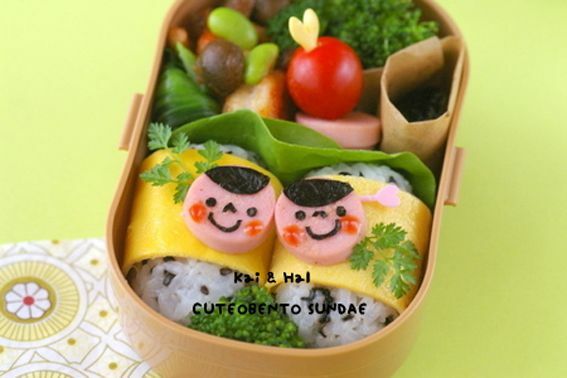 )...I spend an unnatural amount of time thinking about, reading about, cooking or eating bento. The first thing I do upon arrival in Tokyo is take myself off to LoFT, Tokyu-hands or famous Japanese 100Yen store Daiso to stock up on Bento supplies. 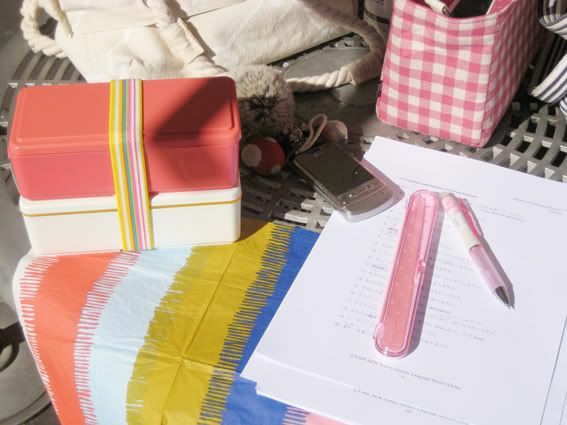 Think polka dot and gingham patty papers, pink and canary yellow faux grass dividers, flagged toothpicks and oshibori's (KFC style wet wipes). On my most recent trip I picked up a black metallic hologram bento (Sharon calls it my 'bling bento' or my 'star wars bento'), a love heart shaped bento, a set of polka-dot hashi (chopsticks), and lots of pretty Furoshiki. There were of course, also a few fun bento tools thrown in for good measure. 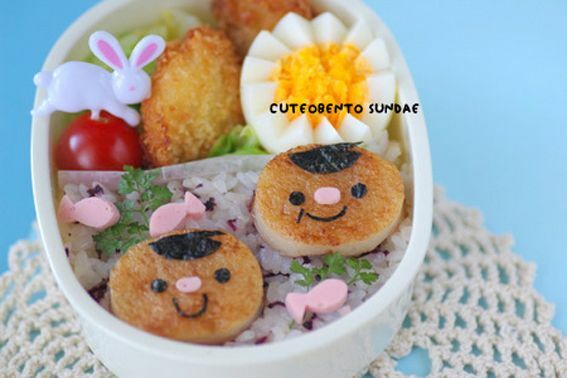 Alphabet cutters to write messages in things like ham and cheese and a nori (seaweed) cutter to give onigiri (rice ball) little onigiri men faces. Clearly just the 'essentials'. Back home, I like to visit Just Bento . The author Maki, dedicated beyond belief, has even created The Weekly Bento Planner for the serious bento maker. (I promise you I have not taken things that far yet). Lunch in a box is another goodie. Now this is one organised bento blogger! Taking a peek inside her pantry, I think perhaps our friend Martha Stewart might be an inspiration! Lately I have been sourcing bento recipes from some beautiful Orange page bento magazines purchased on my last Tokyo trip. 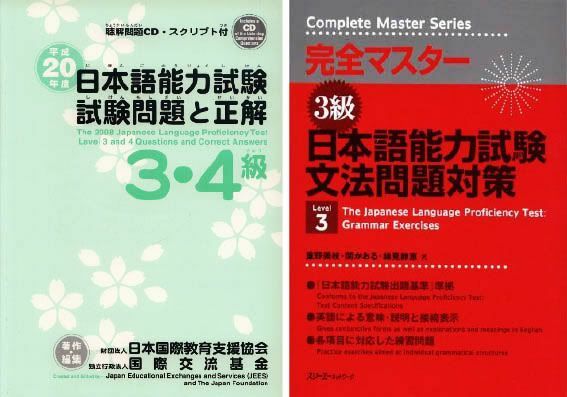 However, it takes me a few nights, armed with Japanese dictionary and Kanji dictionary to translate just one recipe! * Goshiki (five colors): aka(red); kiiro (yellow); ao (green); kuro (black); shiro (white). * Goho (five methods): niru (simmer); musu (steam); yaku (grill); ageru (fry); tsukuru (create). * Gomi (five flavors): shiokarai (salty); suppai (sour); amai (sweet); Nigai (bitter); karai (spicy). * Gokan (five senses): miru (sight); kiku (hearing); kaku (smell); ajiwau (taste); fureru (touch). * Gokan no mon (five viewpoints or outlooks): a set of Buddhist principles on the appropriate state of mind when consuming food. For more information about the above 'five sets of five rules' please click here. For more bento reading please click here, here, here and here. 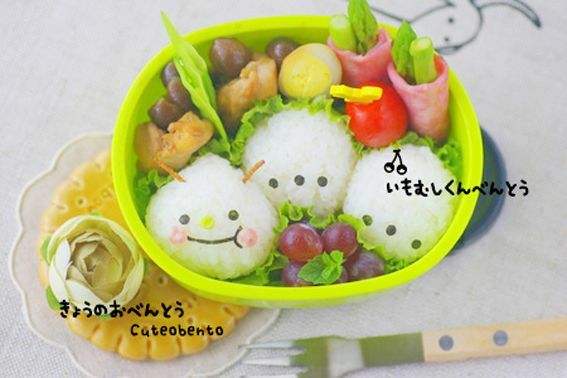 And some other bento sites you might like to swing past if you are thinking of making your cutie a bento lunch are: Cooking Cute, Kawaii Kiki, Bento Bento , and Bento Business.